Why cook your sausages in water when you can cook them in beer? These Pressure Cooker Beer-Braised Sausages with Peppers are ready to enjoy in 15 minutes. In other words, by the end of half-time you will have cooked food for the remainder of the game! Italian sausages come in both sweet and hot varieties. Hot Italian sausages add hot red pepper flakes into the spice mix, while sweet Italian sausages are known for the addition of sweet basil into the mixture. Both work great in this recipe, simply pick your personal favorite! Sear the sausages in hot oil until browned on one side, about 5 minutes. Remove sausages to a plate. Pile peppers and onions into the pressure cooker. Lay the sausages seared-side up on the peppers and onions. Pour beer into the pot. Select Meat/Stew and cook for 5 minutes on High pressure. Serve sausages on buns topped with peppers and onions. Using green, red, and yellow peppers makes this dish as colorful as it is delicious. Just as they say "don't cook with a wine you wouldn't drink," why would you cook with anything other than your favorite beer! The unique flavors and nuances of your favorite beer with infuse into every bite. Per Serving: 746 calories; 43g fat; 55.4g carbohydrates; 29g protein; 122mg cholesterol; 999mg sodium. If you do exactly what the recipes says to do, you'll be happy with your result. HOWEVER . . . I used to live in Wisconsin, so I was unable to resist taking the sausages from the cooker to the grill to finish them there. There's just something about the beer-braise and grill combo that takes me back to those midwestern summers. I was able to not pile on the sauerkraut, though. I love it, but it's not the ONLY thing to go with sausages! This is like hot dogs for grown ups. Plus, sausage and beer are always a good mix! Overall this had a ton of great flavor and was very filling. I will for sure make this again in my pressure cooker. Made these for my boyfriend and he officially thinks I'm the best cook ever! He did not believe that I created this in our pressure cooker. I can't take all the credit though, this recipe was superb! 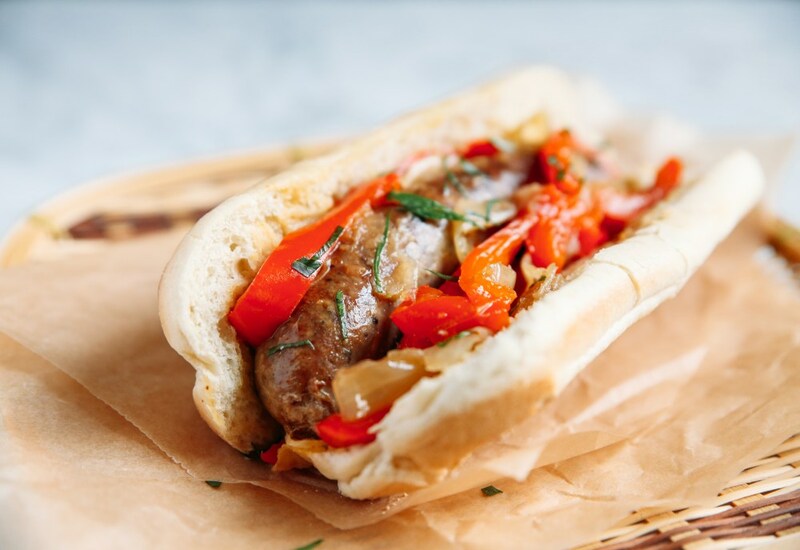 The Italian sausages with the sweet bell peppers and onion are so good together. This was a huge hit in my house!! I have big eaters, so I doubled the amount of sausages. Turned out perfect!! I will be making it again soon!! I couldn't believe how easy and fast this recipe was... not to mention delicious! My husband absolutely loved this! This recipe is so delicious and easy to make! I used "hot" Italian sausages and use frozen peppers (out of laziness). Easy and quick to make for a weeknight dinner! Ate with a loaf of crusty bread & butter. I reduced the liquid and drizzled it over roasted potatoes. Was more interesting than good, but I had to try it. This was tasty! We decided to top our sausages with a dollop of pizza sauce and a sprinkling of mozzarella cheese, because the Italian sausage reminded us of pizza. I left out the red pepper and used green. Turned out great! I used original flavored Brats & beef stock instead of beer. I also browned both sides before sealing. It turned out amazing! Served these on hoagie rolls, and ate the leftovers served with steamed rice. Great both ways!